The bad news: your credit card bill might be a disaster next month. The good news: at least now you can get refunds? 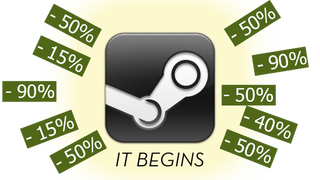 It’s time for the Steam Summer Sale. Today’s big deals include Valkyria Chronicles for $5 (yes! ), Don’t Starve for $4, and all of Tales From The Borderlands for $12.50, among many others. There’s also a crazy new minigame that everyone can play to unlock more deals.